Welcome to Clearly Coastal! 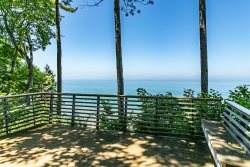 This stylish 4 bedroom 4 bathroom contemporary home is located on a dune above Lake Michigan, which provides great views of the lake through the trees. There is more than 3000 square feet of living space, including two living areas, one of which overlooks the lake. The second living area has a kitchenette and flat screen TV and overlooks the pool area. The house has been refurnished for 2017 as well. There are four bedrooms, three with lake views: a master with a king bed, a second hall bedroom with a king bed, and a third bedroom with a bunk bed consisting of a twin and a full bed. The fourth bedroom faces to the south and has a king bed and a bathroom en suite. Other great amenities include an in-ground pool with , newly built pool deck, a pool room, 150' of private beach, beamed ceilings, wood floors, and the aforementioned fantastic Lake Michigan views. 1.63 quiet wooded acres creates an extremely private setting for your next beach getaway! Sleeps 9 in beds. Yellow Bird takes customer service to the highest level. We have rented through them at least 10 times and they are our "go to" when we look to plan a getaway visit to Michigan. We recommend them to all of our friends and to anyone looking to stay where they have homes. The view of Lake Michigan and the location of the home. John and Toni at Yellowbird are the absolute best. We have been renting Yellowbird homes 2-4 times a year, exclusively I might add, for the last 6 years. I would not even think about calling anyone else. The value and service level is exactly what we want and the homes are always well maintained and tastefully decorated. Most importantly the bed linens are always fresh, clean, and nice which is our number one requirement when renting any home. We love vacationing in Harbor County!